Most Android TV box comes with DDR3 or DDR3L memory, but Mecool BB2 Pro comes instead with 3GB DDR4 memory that’s supposed to offer 50% increased memory bandwidth. That’s why I was interested in reviewing the box. I’ve already checked out BB2 Pro hardware in the first part of the review, so the second part will focus on the firmware, video playback in Kodi 17, and benchmarks to find out if there’s any improvement over other Amlogic S912 using DDR3 memory. It’s not the first DDR4 box I’ve tested however, as Eweat R9 Plus powered by Realtek RTD1295 processor also included DDR4 memory, but based on my tests, there’s was no noticeable differences with Zidoo X9S based on the same processor, but with DDR3 memory. But this time, we’ll see if it is any different with Amlogic platforms. I connect a USB 3.0 hard drive to one of the USB 2.0 port, and a USB hub to the other port with two RF dongle for an air mouse and a gamepad, as well as a USB keyboard. I completed the setup with HDMI and Ethernet cables, and finally the power supply. The system will boot automatically when you connect the power, no need to press the power button, and the boot will typically take around 25 seconds. Please note the boot animation logo could with some music, so the boot is not silent, which may be annoying if you want to use the box while others are sleeping, and turned on the TV before the box. The launcher will look similar to regularly readers as it’s exactly the same as the one found in K1 Plus, another TV box also made by Videostrong. The notification bar is enabled by default, but not the status bar which can be enabled in the settings. This option should really be present in all boxes. The list of preinstalled apps include the Play Store, Kodi, Netflix and others. 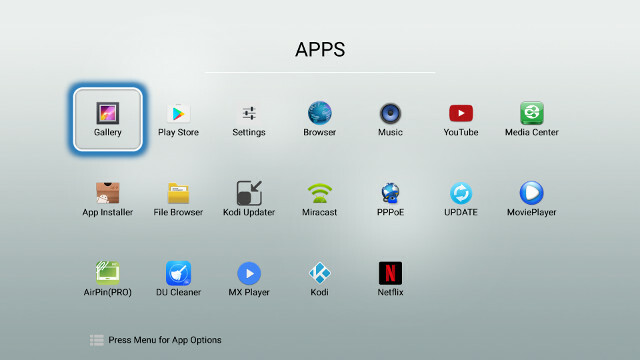 You’ll also notice Kodi Updater, an app to update the likely-custom version of Kodi used in the box. My version was Kodi 17.0-Beta3 and was the latest available at the time. The settings are also basically the same as in K1 Plus, and other Amlogic S905/S905X/S912 TV boxes. I had no troubles using WiFi and Ethernet, and set my resolution to 4k2k-60Hz supported by LG 42UB820T Ultra HD TV. Some less common settings include RGB mode (maybe to fix some pink screen issues), and Status bar (on/off), and there are settings for HDR and HDMI self-adaptation (auto framerate switching). The internal storage has a single unified partition with 762MB used. The total capacity is reported to be 16.00GB but that’s obviously a hard-coded value, possibly to avoid customers complaining there’s not 16GB storage in their 16GB TV box box. The box could also mount NTFS and exFAT file systems in the USB hard drive. A FAT32 micro SD was also supported. The “About MediaBox” section report the model number is BB2 Pro running Android 6.0.1 on top of Linux 3.14.29. The firmware is rooted. 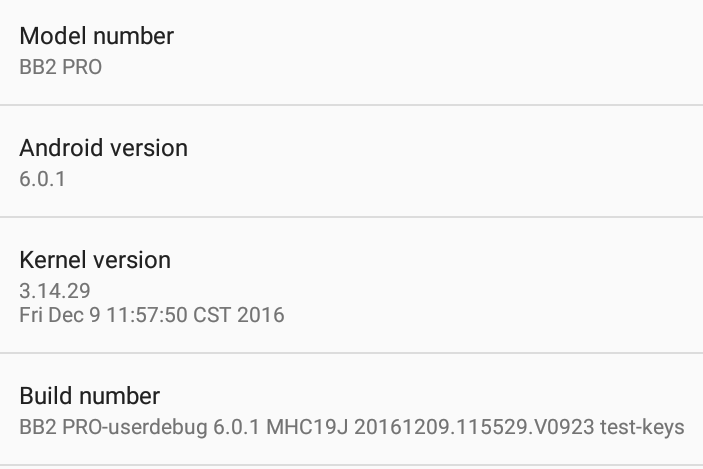 OTA firmware update appears to have been implement through “Update” app, but it would detect no new firmware, so I could not test it. 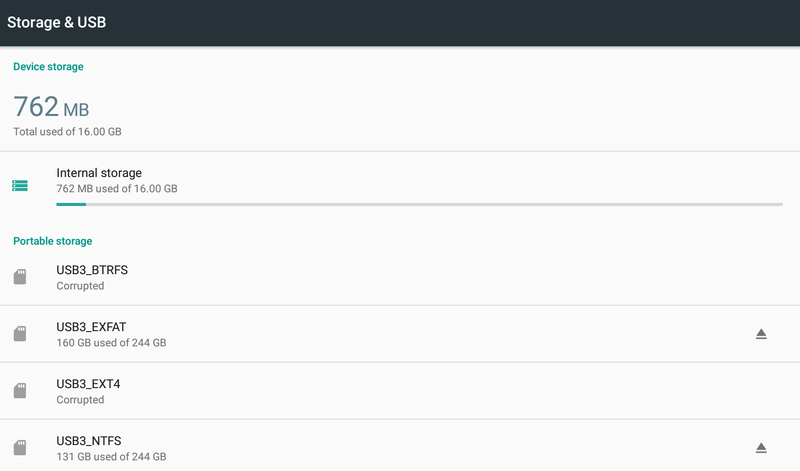 Google Play Store worked just fine, except for Bluetooth LE apps such as Mi Fit or Vidonn Smartband. Albeit it should be easy to fix, this is an issue common to almost all Amlogic S912 TV boxes. I also install the free version of Riptide GP2 through Amazon Underground. I had no troubles using the infrared remote control up to 10 meters, and the IR learning function worked too. However, I used MINIX NEO A2 Lite air mouse for most of the review since it’s more convenient in Android. I’d recommend an air mouse with keyboard and IR learning function (to be able to turn on the device) for the best user experience. A short press on the power button of the remote control will trigger standby mode, while a long press will pop-up a window to confirm you confirm to power off the define. I could also restart the box from the power button from the remote and the unit. Idle power consumption is the same as M12N TV box, but power off power consumption is a bit on the high side possibly partially because of the red LED that is quite bright. This time I only measured the temperature on the top of the case, as the bottom is bright and my IR thermometer reported wrong values for the bottom. The top of the case temperature was 39°C max after Antutu 6.x, and 44°C max after playing Riptide GP2 for about 15 minutes. I also checked the soc-thermal value in CPU-Z after the games and it was 78°C, against around 55 °C in idle mode. Riptide GP2 played fine, but not perfectly smooth, like on other Amlogic S912 TV box, and performance was constant. I did not notice any obvious improvement over S912 TV boxes using DDR3 memory. Mecool BB2 Pro feels like using other Amlogic S912 TV boxes with a stable firmware, and good performance overall, but again I could not really noticed any performance boost from DDR4 memory. BB2 Pro runs Kodi 17 Beta 3, or at least a custom version of it with TVaddons.org add-ons installed. I played most videos samples from a SAMBA share through Gigabit Ethernet. phfx_4KHD_VP9TestFootage.webm (VP9) – Won’t play, stays in UI. BT.2020.20140602.ts (Rec.2020 compliant video; 36 Mbps) – OK.
tara-no9-vp9.webm (4K VP9 YouTube video) – Won’t play, stays in UI. The.Curvature.of.Earth.4K.60FPS-YT-UceRgEyfSsc.VP9.3840×2160.OPUS.160K.webm (4K VP9 @ 60 fps + opus audio) –Won’t play, stays in UI. I also tried the 3 VP9 videos above with MoviePlayer with all I got was a black screen. That’s too bad, as I wanted to see if DDR4 memoryu would improve “Curvature of Earth” playback that is not 100% smooth on all other devices I’ve tested. Automatic frame rate switching is not working in Kodi, and MoviePlayer, so you won’t get perfect playback for 24 fps videos, unless you set the frame rate manually. Audio support is not quite perfect, just like in other Amlogic S912 TV boxes I’ve tested. PCM output (stereo downsampling) works with Kodi, but not MX Player/MoviePlayer apps, and HDMI pass-through using Onkyo TX-NR636 receiver is a disaster in Kodi, and somewhat works with MoviePlayer. BB2 Pro got 851 in Antutu Video Tester 3.0 benchmark, a little less than in other Amlogic S912 based TV boxes. 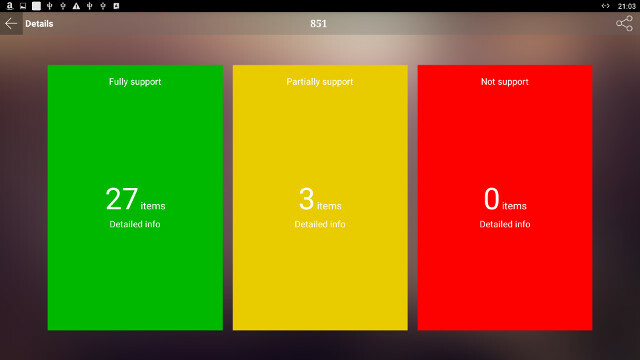 The three videos with “partial support” are exactly the same as on other devices. 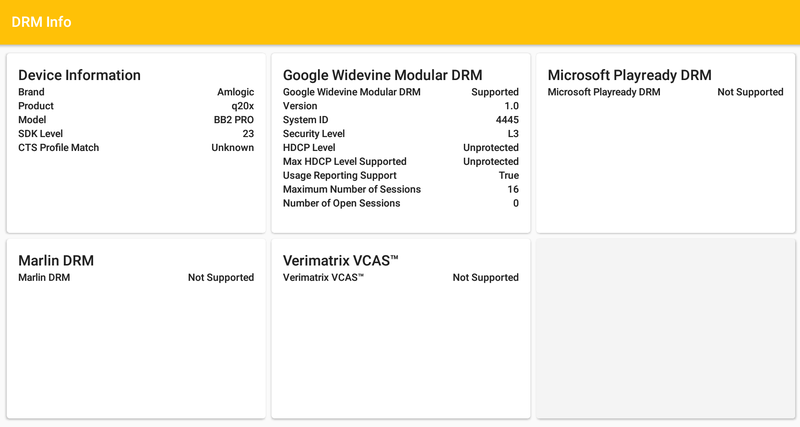 DRM Info app reports Widevine Level 3 DRM is supported by the device. In order to test WiFi performance, I copied a 278MB file between a SAMBA share and the internal storage – and vice versa – using ES File Explorer, both using 802.11n @ 2.4 GHz, and 802.11ac (433 Mbps). The results are not that good, although download speed is quite faster than upload speed. 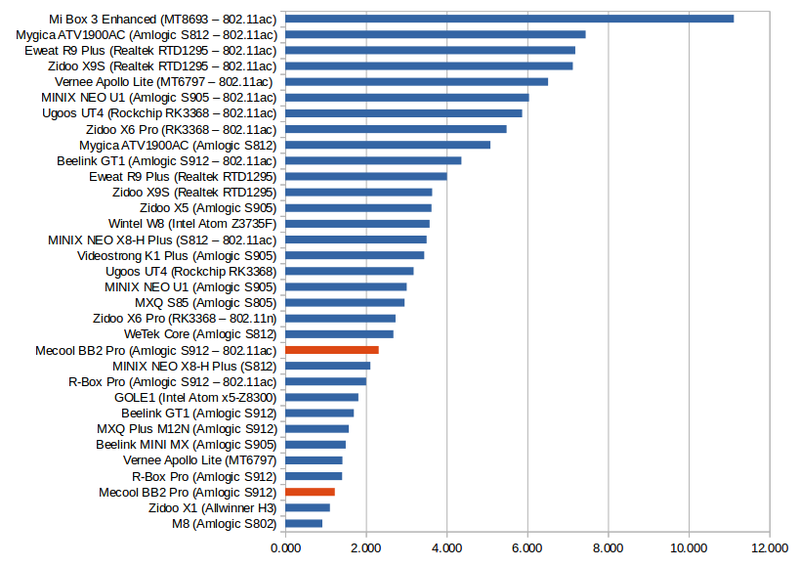 WiFi Throughput in MB/s – Click to Enlarge! Sadly those poor WiFi numbers are quite typical of Amlogic S912 TV boxes. Note that download speed for 802.11ac was 5.05 MB/s on average, so not so bad, but upload speed @ ~1.5 Mb/s brought the average down significantly. For some strange reasons Gigabit Ethernet suffered from the same issue, as transferring a 885MB file took 50 seconds to download (17.7 MB/s), but 2 minutes 18 seconds to upload back to my local server (6.41 MB/s). I’ve never seen that problem on other devices. My SAMBA server is connected via Gigabit Ethernet and uses a SATA drive (not USB) capable of 100 MB/s writes. Asymmetric performance happens more often with iperf since transfers occur in both direction at the same time. Nevertheless there seems to be some minor issues with Ethernet. 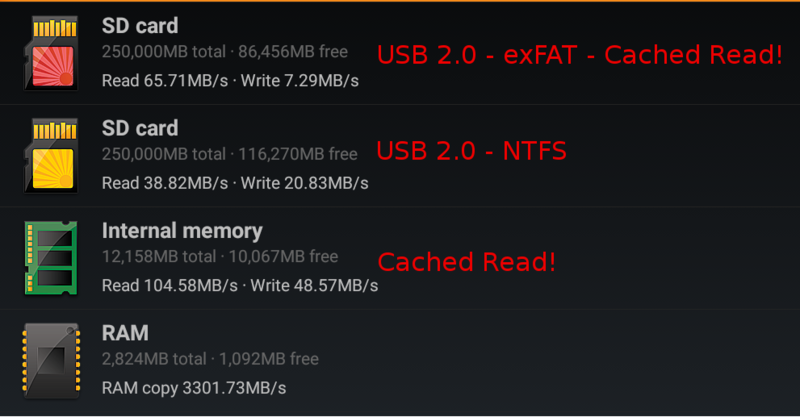 We’ve already seen the system could handle NTFS, exFAT and FAT32 file systems for external storage, so I tested the performance of both NTFS and exFAT partition on my hard drive as well as the internal memory using A1 SD bench app. Note that both internal memory and exFAT partition had “cache reads”, which means reading operation was at least partially done from RAM. We can discard read results for both, especially since 65.71 MB/s is totally impossible over USB 2.0. What we can see however if that exFAT write speed is quite poor, but again that’s common to almost all TV boxes I’ve review. USB 2.0 NTFS partition read performance is about the best you can get through USB 2.0, and write performance is OK. The eMMC flash write speed is quite good @ 48.57 MB/s, so read speed is likely to be good too, but lower than the 104.58 MB/s reported by the app due the “cached read”. As I looked for benefit from DDR4 memory in this review, I was hoping that maybe games would benefit one way or other. Riptide GP2 with maximum graphics settings seemed to perform just like other Amlogic S912 TV boxes, that is… playable, but not extra smooth like on Xiaomi Mi Box 3 Enhanced for example. Performance was constant over the 15 minutes I played the game, so I did not notice any overheating and throttling issues. So far I have to say I could not notice any user experience benefit from using DDR4 memory, but maybe benchmarks could give a different picture. Let’s check CPU-Z first. The device is BB2 PRO (q20x) with 8x Cortex A53 cores @ up to 1.51 GHz and a Mali-T820 GPU as expected. Other settings are as expected, and we can see the real internal storage capacity available to the user: 11.87 GB. That’s perfectly normal once we take into account the space taken with the bootloader and Android operating system. Then I ran Antutu 6.x and compared the results to M12N TV box benchmark results. BB2 Pro got 363 points extra, but we can consider both devices had about the same performance. RAM test should be interesting and BB2 Pro was about 12% faster. So maybe there’s some benefit, but very minor based on those Antutu results. 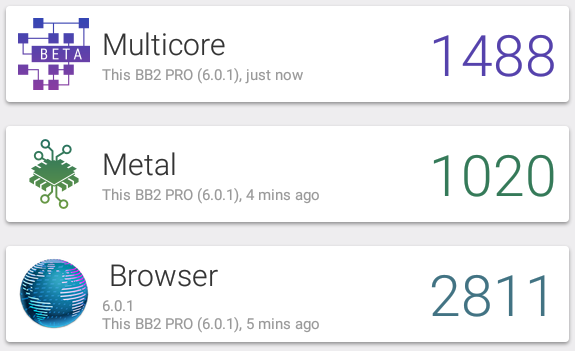 Vellam score is about the same story with BB2 Pro getting 1,488, 1,020 and 2,811 points for respectively multicore, metal, and browser tests, against 1,103 (test failed to complete), 1,052 and 2,758 points on M12N. If we discard the multicore that failed to complete on M12N, results are basically the same. 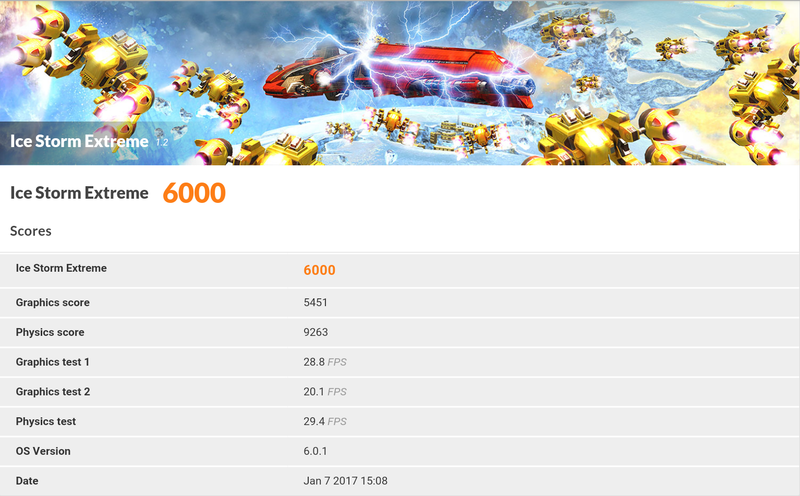 The last benchmark of this review, 3DMark Ice Storm Extreme, shows a little improvement as BB2 Pro got 6,000 points against 5,732 points for M12N. But it’s hard to tell if it is because of the DDR4 RAM, or some improvements of the GPU drivers. If we look into details of the score, most of the improvement is with the Physics score & test (9263 point / 29.4 fps vs 8163 / 25.9 fps). I have not been able to find a single use case showing a clear benefit from using DDR4 memory instead of DDR3 memory. 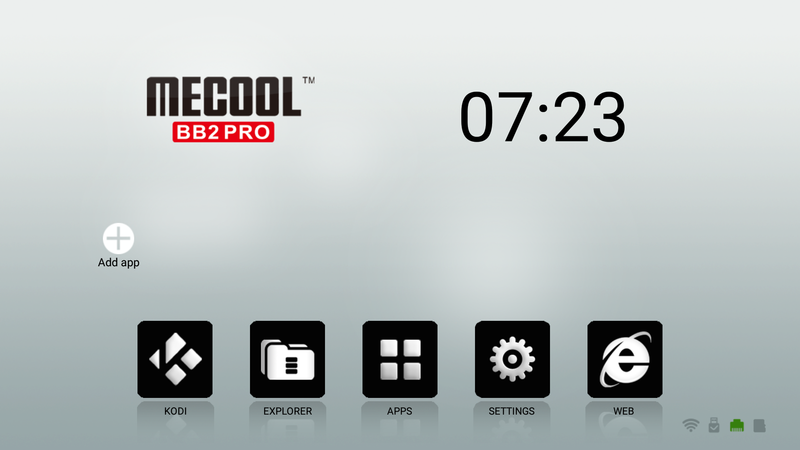 Apart from that Mecool BB2 Pro works reasonably well, it feels fast enough and the firmware is stable. 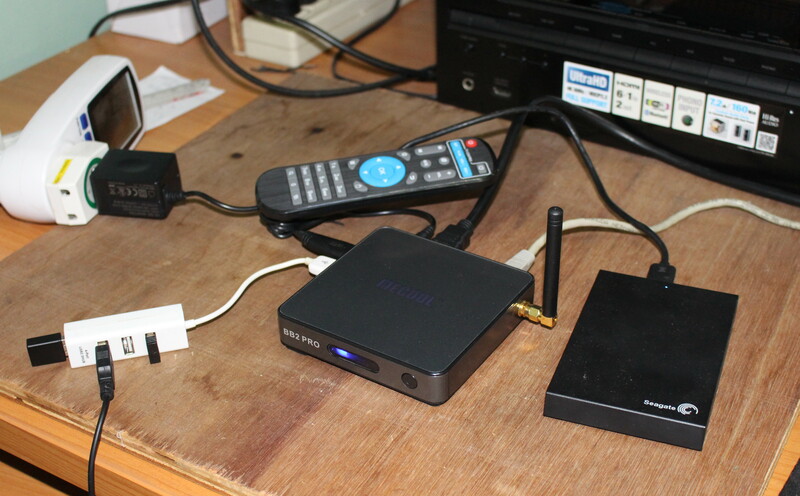 However, it also comes with most of the same caveats found in other Amlogic S912 TV box, including mediocre WiFi performance, lack of HDMI audio pass-through support in Kodi (except Dolby Digital 5.1) and DTS HD 7.1 not working in the local player (MoviePlayer), automatic framerate switching not working at all, and for some reasons I could not play any VP9 in the device. Mediocre WiFi performance, especially for uploads. Ethernet is also somewhat slow for uploads (no problems for downloads). I’d like to thank VideoStrong for providing a sample for review. Distributors and resellers may contact the company via the product page to purchase in quantities. Mecool BB2 Pro can also be purchased for $66.66 and up on Banggood, GearBest, and eBay, or about the same as YokaTV KB2 with 3GB DDR3 instead of 3GB DDR4, but 32GB storage instead of just 16 GB, with the rest of the specifications being equal. It seems lack of performance sometimes comes down to how high they can clock the DDR chips, regardless of version. So ODROID-C2, which AFAIK is one of the boards with higher clocked DDR3, manages to do 20%+ higher performance Geekbench per core than other S905 and S912 chips. The implementation of this octa-core is also quite useless since it’s a 32-bit memory channel on the chip, which will starve it most of the time. Small caches also doesn’t seem to help and there’s not much benefit in going over quad A53 with these cheap SoC implementations – you won’t find many apps that run inside the small amount of cache. Great review! I like the logo sound notation. Those are the small things that are important. friend, you forgot tell that it has some modified version of youtube – it works bad. if you will install youtube from play market it will not work at all. If it helps, I can play 4k video files at 1080HD @50HZ on my fullHD Samsung TV. I have no 4K TV and I download video to Rom. I used a Alfawise s92 2GB ram. Android 6 video player works and from Google app store PlayerExtreme . Not had to install mx player at all. Tried kkplayer out of interest as it claims VP9 by software player, however sound messed up and stuttering sound on playback. I know you use Riptide GP 2 for continuity of tests across equipment but if you are interested Riptide GP Renegade is free on Amazon underground also know. Thanks for the tip about Riptide GP Renegade. I heard it was a bit more demanding then GP2, maybe I’ll have to start using it with more powerful devices for example TV boxes with RK3399. Oddly enough I can run it at stock settings on a Amlogic s805, not yet tried seeing how high on settings a s912 can run it. Another cheap AML S912 bound for the Junkheap then. The S912 pile must be getting quite large by now ! I am using the cheap Alfawise s92, no 5.1 audio through it says, but for general hdmi watching, it is not bad. BBC iPlayer picture is better. Amazon Video series Ripper Street and Man in high Castle look good on my sub 2 MB broadband. I downloaded Florain Friedrich’s timelapse project 4K demo and it looks good in 1080HD 50Hz. Software wise not perfect but useable certainly . I may have fixed youtube not playing videos on the official youtube app from the playstore,this box does not play webm vp9 ,that is what youtube uses by default I believe, so I may have tricked youtube into using h264 by default, in which this box supports.I went digging into the youtube folder in /data/data/com.goole.android.youtube/shared_prefs/ open youtube.xml in an editor ,this i assume is where all the settings of youtube are kept.Find any line that has vp9_supported6.0.1_******” value=”true” /> and change the value to false and save the file.Make sure Youtube is closed before doing this, otherwise it may fault back to original value. I have tested this and it worked, I tested it when the video is using vp9 and not working and I tested with the value changed to false,and the video worked and using h264. Do you suggest Minix Neo U1, rather than BB2? I’d recommend MINIX NEO U9-H over BB2. MINIX NEO U1 is not too bad either. It just lacks HDR, VP9, and OpenGL ES 3.0 support. It may or may not matter to you.